Bread has gained a reputation as a diet-busting bogeyman, largely thanks to diets that encourage eliminating it from your menus for weight loss. To be sure, some types of bread are mostly empty calories that provide little nutrition and hunger satisfaction, which can hinder your weight-loss efforts. Other types, however, are loaded with nutrients and even can help you reach your weight goals. You can break the many varieties of bread down into two basic types: whole grain and refined grain. Whole grain breads are made using entire grains -- including the outer layer, called the bran, and the inner part of the seed, know as the germ, regardless of whether the grain is wheat, rye or a mixture of grains. In refined-grain breads, manufacturers remove the germ and bran from the grain. As such, refined grain breads lack many of the nutrients in whole grain breads, including fiber, potassium selenium and magnesium. Although manufacturers fortify some refined grain flours with vitamins, they still lack the nutritional punch provided by whole grain breads. Whole grains, including whole grain bread, are an essential part of your diet and even can help with weight loss. The U.S. dietary guidelines suggest eating at least 48 g of whole grains per day as a part of a 2,000-calorie diet, and a slice of whole grain bread provides about 16 g of those. Because whole grains don't break down as easily inside your body, they will be more satisfying and leave you full longer than refined grain breads, meaning they'll help you consume fewer calories overall. In addition to weight control, research suggests whole grains also can help reduce your risk of heart disease and help prevent constipation. 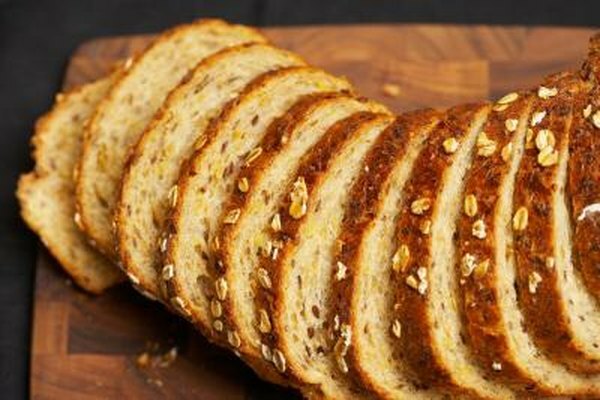 As long as you keep your overall caloric intake under control, you still can lose weight while eating refined grain breads, though you should limit your servings to no more than three daily. A serving is one slice, so a sandwich using refined grain breads will constitute two servings. Also keep in mind that whole grain vs. refined grain is not synonymous with wheat bread vs. white bread. Some wheat breads are made from refined grains, and you can find white bread made with whole grains. Look at the ingredients of your bread to see whether a whole grain is listed as the first ingredient, which indicates that it is a whole grain product. You also can look for the "made with whole grains" stamp that appears on such products. Also look for "100 percent whole wheat" on the bread package. You might be reticent to eat bread while dieting because you've heard of the effectiveness of low-carbohydrate diets, in which you eliminate not only bread, but also all grains and many fruits and vegetables from your diet in favor of more protein. While you can lose weight on such diets, it's mostly because you're consuming fewer calories overall due to the restrictiveness of the diet, not anything directly related to carbs, according to the American Medical Association. Additionally, these diets can cause high cholesterol, constipation and a condition called ketosis in which your body does not fully break down fats, especially if you're consuming proteins high in saturated fat. You're better off maintaining a well-balanced diet that incorporates servings of whole grains, including bread.